Aug 18, 2010 • The most definitive map of Earth’s mangrove forests has been created with Landsat data. A group of scientists, led by Chandra Giri from USGS-EROS, has calculated that approximately 53,190 square miles (137, 760 km²) of mangroves exists, 12.3 percent less than the previously accepted 2007 estimate produced by the UN’s Food and Agriculture Organization. “Mangrove forests are among the most productive and biologically important ecosystems of the world” Giri writes. They consist of trees, shrubs, and Nypa palm that grow in tropical and subtropical tidal zones—the largest concentration straddling the equator between 5º N and S—and they have adapted to extremely harsh environmental conditions, thriving in regions of high salinity, scorching temperatures, extreme tides and flourishing in muddy, sediment-laden waters with oxygen-free soils. A portion of the map showing mangrove forests distributions of the world. This portion focuses on SE Asia. Credit: Giri et al. Mangroves provide vast breeding and nursing grounds for marine life as well as food, fuel, and medicine for local communities. They also serve as a first line of defense against hurricanes and tsunamis by dissipating the energy of these natural disasters and thereby protecting people and property from the whims of nature. But pressures on mangrove forests are mounting. A growing human population puts development pressure on coastal regions. Intertidal lands are being converted to agriculture, aquaculture, urban developments, and tourist destinations at increasingly rapid rates. In the two decades between 1980 and 2000 over a third of global mangrove forests were lost. This rate is higher than the loss of inland tropical forests and coral reefs. If this trend continues all mangrove forests could be lost over the next century. A massive loss of mangroves could be detrimental. It is estimated that mangroves sequester over 20 million metric tons of carbon each year meaning further mangrove loss will affect atmospheric greenhouse gases and the climate. In a cruel feedback loop, a warming climate could lead to more frequent and severe storms wreaking havoc on mangroves and to increased sea-lea level rise—which poses the single greatest threat to mangrove forest viability. Given the importance and vulnerability of mangroves, Giri and his colleagues set out to establish a definitive georeferenced global baseline of mangrove extent. Previous estimates varied by as much as 74 percent and were created by cobbling together a variety of studies (such as country reports) with inconsistent methodologies. 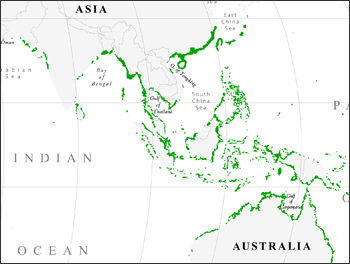 Using Landsat data, Giri was able to map the global extent and distribution of mangroves at a 30-meter spatial resolution using a single data source and methodology. Mangroves “look” a certain way in Landsat images, i.e., the visible, near-infrared, and mid-infrared energy they reflect is digitally discernable when Landsat data are analyzed. More than 1,000 Landsat scenes (collected between 1997 and 2000) were used in this study; each was individually analyzed. This massive undertaking involved the work of 30 student interns and visiting scientists from Asia, Africa, Europe, South America, and North America. The coalescing forces of an open and free Landsat archive, the free Landsat Global Land Survey (GLS), and faster computer processing ability made this project possible. “Pre-processing global coverage of Landsat data at the project level is a gigantic task,” explains Garik Gutman, the NASA Land Cover Land Use Change Program Manager who funded Giri’s work. The GLS data sets (funded by NASA and USGS) assemble a cloud-free, orthorectified collection of Landsat images thereby eliminating a tremendous amount of data pre-processing for researchers and enabling such colossal global studies like this mangrove assessment. Giri’s assessment represents the most comprehensive global database of mangrove forests ever created. It has revealed that the remaining global mangrove forests extent is only half of what is thought to have once existed (mangrove intactness and loss varies from country to country). While the world’s remaining mangrove forests are spread across 118 countries and territories, three-quarters of the mangroves reside in just 15 countries and less than seven percent are protected. Asia has 42 percent of the world’s mangroves, followed by Africa (21 percent), North/Central America (15 percent), Oceania (12 percent) and South America (11 percent). The assessment confirms that the vast majority of mangroves exist between 30º N and S (with a few exceptions just outside of this range in Japan, Bermuda, Australia, New Zealand, and South Africa). 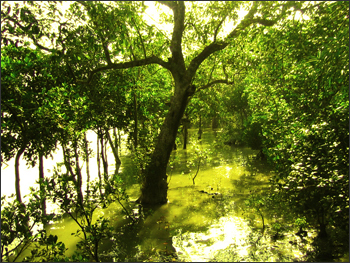 And, it also confirms that mangrove area decreases with increasing latitude excluding the Sundarbans—the world’s largest tract of mangroves located in the Ganges delta (20–25º N)—which remarkably has remained undiminished despite the world’s highest population density in its immediate vicinity. This new database provides robust information that could impact future mangrove management and conservation practices. “Conservation of this dwindling coastal forest—threatened by anthropogenic and natural forces such as conversion to other land uses, storms, and sea level rise—is needed as it provides important ecosystem goods and services to coastal communities including protection from natural disasters such as hurricanes and tsunami,” Giri explains. This research has been published in the journal of Global Ecology and Biogeography. This entry is filed under Ecosystems and Biodiversity, Forest Management, News, Science.